The British Gazette » UKIP: Salvaging something from defeat. 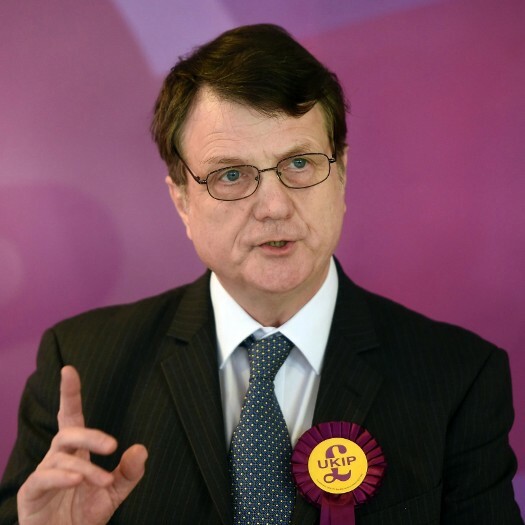 Above, UKIP’s Leader, Gerard Batten. Kippers are at the moment angry and worried. It is a FACT that political activism is a popular retirement activity for those of pensionable age who have in addition to their state pensions, other income sources to enable them to live in varying degrees of comfort. This applies across the political spectrum. Many Kippers have campaigned against what they would describe as the never to be sufficiently damned abomination that is the European Union of the Cities and the Regions (to give the supra-national monstrosity it’s full title) since the mid to late 1960s when the politicians in the UK first started the process of joining what was then described – in Britain only – as “the Common Market”. The coining of this phrase is historically significant for this demonstrated the beginning of a campaign of deception that has lasted throughout this formerly sovereign nation’s membership of the EC/EEC/EU and has persisted through the Brexit crisis to the present day. The biggest irony is that UKIP – albeit unknowingly and therefore innocently – have taken part in this deception. UKIP and it’s membership are however NOT GUILTY of deception. This is because they themselves honestly believe what they proclaim. When you see a Kipper protesting outside the Palace of Westminster where “un grand coup de théâtre” is being staged with a placard stating, “No Deal – No Problem!” they really do believe this. Kippers are angry and worried because they fear (correctly) that Brexit is being betrayed. They are however incorrect as to the way it is being betrayed. To reveal how this so we have to indulge in what this organ and the mainstream media have being doing of late – speculating! In his blog-post today (http://eureferendum.com/blogview.aspx?blogno=87176), Dr. North speculates that if Madame’s “Meaningful Vote #3” is voted down then she will opt for a long extension of Article 50 and following this Remainers will campaign to stop Brexit. The method of stopping Brexit is of course well known: it is the Second Referendum! It is at this point, some honesty is required of those (including your Editor) who would describe themselves as “Brexiteers”. This means they have to ask themselves the question: Thy would you object to a Second Referendum along the lines suggested in Wednesday’s BG Post (http://www.british-gazette.co.uk/2019/03/13/wrexit-where-do-we-go-from-here/), of a triple choice of #1 Madame’s appalling Deal; #2 Revoke Article 50; #3 No Deal in the first round with a second round run-off for the top two choices? Answers: #1 Because of the fear that the voters would vote to Remain! #2 Since “Leave” won, there is nothing to be gained and everything to loose! These beliefs are shared of course by the Remainers! #1 But because of the HOPE that the voters would vote to Remain! #2 Since “Leave” won, there is nothing to be gained and everything to loose! #2 Since “Leave” won, there is everything to be gained and nothing to loose! However, the FACT is that the Remainers are NOT seeking a Second Referendum along the lines suggested by this organ! The Remainers do NOT want the option of a No Deal on the ballot paper. This is because they declare (correctly) that such would be extraordinarily damaging to the UK. However, although this may be “playing safe” with the UK economy it is playing dangerously with the politics in the UK! This is because UKIP and others will (correctly) describe a Second Referendum that is a choice between Madame’s Deal and Revocation of Article 50 as a betrayal of Brexit. This is because UKIP and others already describe (incorrectly) Madame’s Deal as BRINO (Brexit in name only). Whilst we would agree that Dr North’s speculation about the possibility that a defeat of “Meaningful Vote #3” will be followed by Madame requesting a long extension (or the EU offering such as a “Hobson’s Choice”) may very well come about, there is another scenario which this organ suggest is just as likely, if not more so. Let us face it; it was Madame herself who (correctly) described herself as “a bloody difficult woman”! We already know that “Meaningful Vote #3” will be put yet again to MPs before Madame embarks on her next journey to Europe to appear before the European Council, 21-22/03/2019. IF – which will be subject to the DUP changing their position in the talks this afternoon, is a very, very big IF – “Meaningful Vote #3” is voted through, then the outcome is a foregone conclusion. The EU27 will unhesitatingly grant the extension to 30th June 2019. IF – and it is likely – “Meaningful Vote #3” is voted down, then rather than agree to a request for an extension, the EU 27 might instead send Madame away, not empty handed but with what in effect will be an ultimatum. They will schedule an “Emergency” (and for once this word will NOT be an exaggeration) Council Meeting for the following Thursday (28th) and Friday (29th). Madame will then put “Meaningful Vote #4” before the House of Fools! Here we are truly in uncharted territory. This is because convention dictates that a motion defeated cannot be resubmitted unaltered again in a Parliamentary session. “Meaningful Vote #2” was allowed because of the “Letter of Understanding” Madame returned with from Europe. According to precedent, “Meaningful Vote #3” should NOT be allowed. Whilst the Speaker appears to have allowed “Meaningful Vote #3”, it is questionable whether or not he would allow “Meaningful Vote #4” if it was not different from #2 and #3. Were “Meaningful Vote #4” to contain the amendment suggested by Peter Kyle the Labour Member for Hove and Portslade and Philip Wilson the Labour Member for Sedgefield – a binding “Confirmatory Vote” to put the choice of Accept Madame’s Deal or Revoke Article 50 before the voters. If “Meaningful Vote #4” was not to contain the aforementioned amendments, at this point, the Speaker might intervene to force such! With Madame’s Deal voted through, them Madame could turn up at the meeting on the 28th/29th and receive the EU’s extension until June 30th. IF this happens, expect Madame Mayhem and Comrade Corbyn to enter into a secret pact! This will be to see to it that the “Confirmatory Vote” takes place after Thursday 23rd May! This will mean that should the voters vote to revoke Article 50 and Remain in the EU, the Europarl elections will have taken place and thus UKIP and the Liberal Democrats will NOT reap their expected rewards! The European Court of Juggling will of course duly levy a fine on the UK (200 Euro per UK registered voter?). IF the above comes about it will bear out this organ’s speculation that this whole process was a charade from start to finish. In the event of no Brexit, were the ConLab EuroParl conspiracy to take place, only the 2019 elections would be affected. The elections of 2024 would take place. However, it might be that the Tory government would seek to get the EU to revert to the earlier EuroParl practice relating to the elections for same, with each member state deciding how to elect it’s MEPs. This would enable the Tories to reintroduce the FPtP system which would of course benefit the Tories and Labour. UKIP would be rightly seen as the reason and principal victim of this gerrymandering.